The Nintendo Switch is here, and with it the highly anticipated, highly delayed, and critically acclaimed: The Legend of Zelda: Breath of the Wild. Breath of the Wild is a total departure from the traditional Zelda formula that has been in use since SNES classic The Legend of Zelda – A Link to the Past. Early adopters have already been sinking hundreds of hours into the game while others debate over buying the Wii U version till they can find a Switch. Regardless of how you finally play the game you will be treated with what is probably the best Zelda ever made. You awaken to a mysterious voice calling you back from blackness. You are surrounded by strange liquid in a strange chamber in a strange room. The voice calls for you to take an item from a nearby pedestal, and to follow a map found on the device to a nearby location. Emerging from the ancient shine you gaze out upon what remains of a Hyrule that has suffered devastation. In the distance, you see a man gazing in your direction turn and return to his campfire. Maybe this man can help you figure out who you are and what is going on? The man reveals that Calamity Ganon returned to Hyrule 100 years ago, killed all the champions of the four Divine Beasts and the Hero with the sword to seal evil. Alone Princess Zelda has kept the beast sealed within the grounds of Hyrule Castle waiting for the day the Hero would return and reclaim the Divine Beasts and stop Calamity Ganon once and for all. Breath of the Wild brings Zelda into an expansive open world unlike any Zelda game we have seen before. While both A Link Between Worlds and the original Legend of Zelda games featured open worlds and gameplay, neither can match the sheer scale or challenge that Breath of the Wild has delivered. Players start the game on the Great Plateau with only the simple objective of going to a point on the map located on your Sheikah Slate. Players can either choose to set out towards this point or just head out into the world. The Sheikah Slate is a new device in Breath of the Wild that acts as your logbook, inventory screen, map and camera. 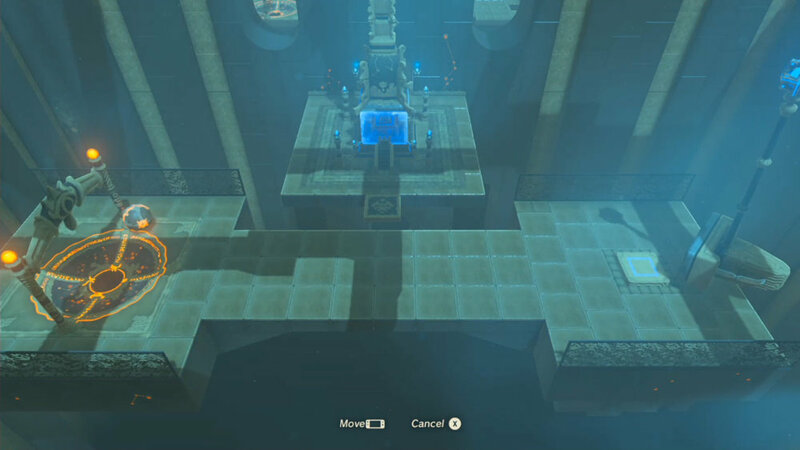 Similar to Assassin’s Creed’s eagle vantage points, players can expand their maps by climbing to the top of Sheikah Towers scattered throughout the map. Right from the start players will discover the key to Breath of the Wild is gathering; food and resources are everywhere. Weapons and shields are found in the world or looted from fallen enemies. Each weapon, bow and shield has a set amount of durability so having multiple on hand is always recommended. Numerous sets of armor and clothing are also available to purchase or find. Enemies can drop items to be used in armor or clothing upgrades and the new cooking system. The cooking system replaces the recovery hearts found in the past Zelda games. Using food and monster parts players can make anything from full recovery food dishes to elixirs that grant extra attack power and anything in between. Rupees are much harder to come by in Breath of the Wild; no longer will cutting groves of grass result in the wonderful green and blue gems. Instead rupees must be earned through selling the items acquisitioned by your gathering efforts. For the more story focused gamer, hidden away in the world are hidden memories and diaries. Memories treat players with voiced moments from Link’s past that he has forgotten and diaries offer insight into how the world has changed since Calamity Ganons return. Also hidden in diaries are recipes for special dishes and elixirs making them useful to find in certain situations. Breath of the Wild, like previous Zelda games, starts players with three heart containers. Also making a return from Skyward Sword is the stamina meter that determines how far Link can run, swim, glide and use power attacks. To expand these stats, Breath of the Wild introduces Shrines scattered throughout the map. Shrines act as mini dungeons that usually offer a decent weapon or shield and a Spirit Orb. Gathering four Spirit Orbs allows players to choose to expand either their life or stamina. Breath of the Wild does not feature the traditional dungeons of past Zelda games but Shrines are a great substitute. While not truly dungeon-esque the four Divine Beasts offer their own unique puzzles and challenges that offer a more traditional boss fight and reward for completion. There are three main methods of travel in Breath of the Wild: foot, horse or fast travel. Traveling by foot is how I spent most my time traversing Hyrule. Utilizing the new climbing, gliding and jump button (that’s right Zelda has a dedicated jump button now! ), allowed me to explore the vast world how I wanted to. While traveling by horse is quicker in certain areas of the map, I would always switch back to on foot often. For those long cross map journeys, every Sheikah Tower and Shrine acts as a fast travel location. Those locations being scattered all over the map, there is always a fast travel point within a short distance of most objectives. Breath of the Wild has very stylized graphics. While most games today strive for photorealism, I greatly enjoy a game that breaks that tendency to deliver a bright, vibrant and massive world. From the first pullback shot over Hyrule after exiting the Shrine of Resurrection to running through the destroyed remains of Hyrule Castle, Breath of the Wild is stunning. It never ceases to amaze me as I play that literally anything I see in the distance is part of the playable map; the draw distance is amazing! While both the Wii U and Switch versions of the game tend to have some framedrop in some places this really did little to hamper my enjoyment of the game. Sound work in Breath of the Wild is interesting. While the game has added hit and miss voice work, it is the way the game handles music that is interesting to me. Gone are the overworld themes replaced by the occasional piano melody mixed with the sheer ambiance of being out in the wild. Each town, shrine, Divine Beast and large boss fight still features a great score. Being a huge fan of Ocarina of Time I always get giddy when I hear some remixed tunes from the game in newer Zeldas. Breath of the Wild has a minimal interface. On the top left of your screen you will find your hearts and on the bottom right you will find your mini map, Sheikah Sensor, temperature meter, noise meter and time of day. If this standard set of info is far to overbearing Nintendo added in a pro option that will only display hearts. Breath of the Wild is a completionists nightmare! With 120 Shrines, 900 Korok Seeds, multiple side quests and several upgradable sets of outfits Breath of the Wild can keep players busy for months. With a season pass already announced, we can look forward to further story related content later this year! While an amazing game in almost every aspect Breath of the Wild does have some annoying shortcomings. All the story content you encounter is incredible but there is just not enough of it for how long you spend roaming Hyrule and it leaves me wanting more. Korok Seeds are far too numerous and unlike shrines, that nearly each have a different puzzle, every Korok Seed has only five or six potential puzzles making them overly repetitive. The log book is also an unnecessary disaster of needing to take pictures of every weapon, bow, shield, plant and enemy in the game for them to be registered. Inconsistent voice work also mars the story experience, some voices sound great and others just seem wholly out of place. The biggest letdown with Breath of the Wild comes from the final confrontation with Calamity Ganon. While he looks the part, the fight itself takes incredibly little skill compared to even the Lynel fights scattered throughout the game. Past games in the franchise have had far more epic showdowns. Despite some letdowns, Breath of the Wild is an incredible game that needs to be played. Regardless if you pick it up on the Wii U or track down a Switch and play it that way, you are in for a wonderful treat. While most people will complain about breaking weapons, shields and depleting stamina, this all led me to feel even more powerful when I finally found better equipment or enough Shrine Orbs to upgrade my hearts or stamina. As of this moment The Legend of Zelda: Breath of the Wild is easily my Game of the Year. My Breath of the Wild playthrough took 38 hours to finish the main quest. I am still playing it to finish off the remaining shrines and side quests I have previously missed.